When the pot is hot, put some butter and the sliced mushroom. Add some salt and fresh ground black pepper. Toss the mushroom on a plate. Using the same pot, pour the cream of mushroom concentrated. Add the milk and water. Taste. Add some seasoning if you like. 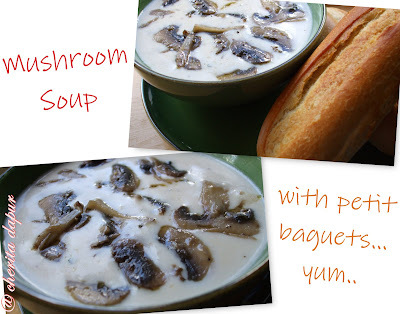 To serve: Pour the mushroom soup in a serving bowl. Place the butter fried mushroom on top of the soup. Garnish with more ground black pepper and some fresh herbs (parsley, scallion or coriander) if you like. You can eat this on its own or with some fresh bake bread, garlic bread or anything you prefer.. we just enjoyed it with some petite baguettes that we bought from our local supermarket.